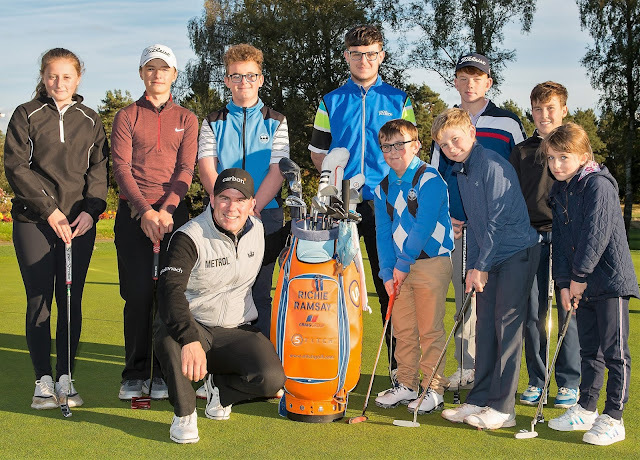 THREE times European Tour winner Richie Ramsay thrilled young members at a Perthshire golf club.The Edinburgh-based pro interrupted his preparations for the Dunhill Links Championship to coach kids at Blairgowrie Golf Club, which hosted the 2014 Junior Ryder Cup. Aberdonian Ramsay is sponsored by Scottish company Carbon Financial, which enjoys a corporate partnership with the Big County club. Ramsay still has three events left this season as he looks to retain his card – the Dunhill Links Championship, The British Masters and the Valderrama Masters. "It is fantastic that the team from Carbon are being so supportive. “Richie provided lots of encouragement, saying he was amazed at the quality of golf on show and that his swing didn't look half as good as some of those that were on display from our juniors at an equivalent age.